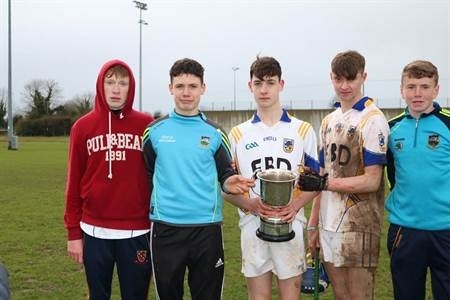 Our opening action of the year took place in Dr.Morris Park last Saturday, March 26th with the staging of the Under 16 Garda Cup Inter Divisional Hurling Tournament. Unfortunately, the weather conditions were no conducive to hurling, but full credit has to be accorded to all the participants for the huge efforts put in. Rain coupled with a strong wind prevailed leaving very low temperatures and on very slippery pitches. Round Robin format prevailed and all games were twenty minutes aside. The opening games commenced at 1.30pm with two games going simultaneously, on Pitch 1 the North played the West and the North men proved to be far superior with a 0-11 to a clear sheet at the interval. In the second period the West notched up 2-03 but their North opponents added a further 1-08 to win on a concluding score reading North 1-19 West 2-03. In the other encounter it was a closer affair. On the fifth minute the Mid men had the South net rattled for the game's only goal. The South response came two minutes later with a point from Conor McGrath. Mark Stokes proved to be a very capable free taker for the South slotting over three points from frees and one came from play courtesy of Thomas Vaughan to give a South a total of five for the first half. Likewise Gearóid O'Connor pointed a free coupled with a point from play for the Mid to put the sides all square at the interval. Upon the restart it was the South that were stronger with a pointed Mark Stokes free and one from play by Martin Kehoe to put the South boys two up. The Mid reply was two pointed frees by Gearóid O'Connor to level the proceedings with ten minutes gone. Moments later another pointed free by Mark Stokes which was to be the last Southern score. The next additions to the score board came from Gearóid O'Connor with two pointed frees to give the Mid a single point victory on a concluding score reading Mid 1-06 South 0-08. The second round of games commenced at 2.50pm with the South taking on the North with the South men enjoying a 1-05 to 0-03 lead at the interval. During the second period they added another five points while conceding 1-01 to win the contest on a concluding score 1-10 to 1-04. In the other decider the Mid were much too strong for the West notching up 1-17 while leaking just 1-02. The concluding games commenced at 4.15pm with the Mid boys commanding the advantage having two victories to their credit and requiring a minimum of a draw against the North to clinch the cup. On the other hand if the North were to win and South did likewise against the West and managed to keep a near to curtail leaking scores they would have a chance of gripping the cup, as there was only the minimum separating both Mid and South in the scores conceded record. In the South v West game it proved to be more agony for the West men as the South coasted to victory leading 3-05 to 1-01 at the interval and only conceded a solitary point while adding 1-06 during the second half for a finishing reading of South 4-11 West 1-02. The other contest between the Mid v North was a very hard fought encounter. In the opening period the Mid enjoyed the wind assistance and finished ahead at the interval 0-5 to 0-2. In the opening moments of the second period the Mid scuffled three scoring opportunities and both sides were showing the strain of the previous games. The North converted two frees to narrow the margin to a single point. Then the Mid boys managed one last attack which resulted with a pointed free by Barry McGrath to give the Mid defending champions a two point victory. Concluding score line Mid 0-06 North 0-04. 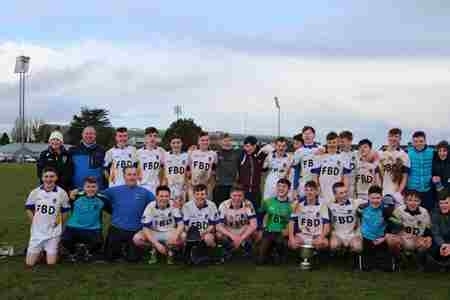 County vice chairman Martin Bourke prior to presenting the Cup to Mid victorious captain David Manning thanked the referees Tom Loughnane, Sean Peters and Shane Hodgins and also all involved at Dr. Morris Park. He praised all the teams for the quality of hurling despite the weather conditions that prevailed.